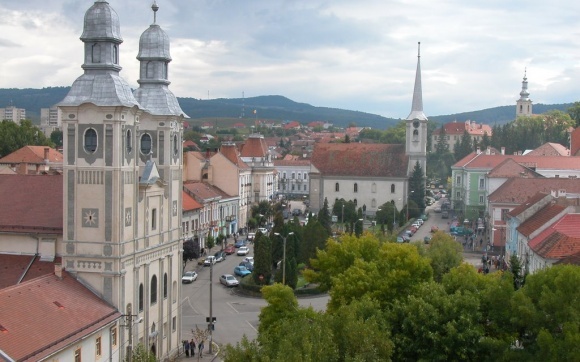 Called "Szekler-Athens" in the last century, Székelyudvarhely is now the second largest city in the county, the center of the historical Udvarhely region and home to one of the most important intellectual scenes for the Transylvanian Hungarians. The town has 33.000 inhabitants, 96% of whom are of the Hungarian minority. The city lies in the southeastern part of the Transylvanian basin, at the upper reaches of the river Nagy-Küküllő. Udvarhely is surrounded by the volcanic Hargita mountain and its branches which form the Küküllő hilly country, with peaks such as: Szarkakő, Csicser, Nagyoldal, Budvár. Archeological excavations show that area has been continually populated for ages. On both Budvar hill and in the town center there are sites from the late Stone Age, Bronze-, Iron Age, Roman period and the Arpadian era. The name of the city was first mentioned in the annual papal tithes register of 1333 as "Uduorhel". In the next century it developed as a market town and starting in 1448 appears in all documents as Udvarhely. The introduction of the Székely title is connected to Gábor Bethlen, Prince of Transylvania (1613). The oldest monument building, from XIII. century, is Jézus Szíve chapel. In the last century the city had many salt-bath, unfortunately they had disappeared, only some fountains indicates their presence. The Museum has a rich history with ethnographic materials. Tegye emlékezetessé látogatását, küldje el fényképes véleményét a ballapanzio@gmail.com e-mail címre.